As up to several people know, the hardworking staff has been on The New Republic like Brown on Williamson since boy publisher Chris Hughes bought the vulnerable opinion journal several years ago. And the worst part is, the lamer the magazine has become, the longer our subscription has extended. TNR has gone from weekly to 20 times a year to 10 times a year; as a result, we’re getting to not read the fading magazine in the comfort of our own home twice as long now. But . . . there’s a silver lining in the cloudy editorial TNR has lately produced. There’s just something about tracking campaign ads across YouTube that is not conducive to binging on an endless loop of accusatory newspaper clippings, conveniently cut soundbites, smack-talk, and shots of candidates strolling with fresh-scrubbed family members or leaning in toward constituents, listening to their concerns. A new feature the New Republic debuts today has changed that, allowing you to see what all that money has wrought, in one place. 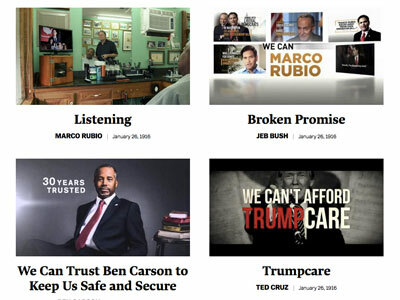 For its new 2016 Campaign Ad Archive, it has gathered all of the presidential candidates’ 2016 commercial ads in a database sortable by name, and soon by issues as well. Each ad is accompanied by a transcript, air dates, places it was aired, and the source of the money behind the ad. And guess what – it’s excellent! Maybe we’re seeing the beginnings of the New – Improved – Republic. One (subscriber) can only hope so. This entry was posted in Uncategorized and tagged boy publisher, Chris Hughes, Corinne Grinapol, FishBowl DC, like Brown on Williamson, The New New Republic, The New Republic, TNR, vulnerable opinion journal. Bookmark the permalink.